Bundled conductors are commonly used to increase electrical capacity and reduce corona and radio noise at voltages above 200 kV. Though the extent of corona and radio noise is impacted by elevation (air density), and other factors such as conductor surface condition and moisture, the bundle dimensions are the primary factor in mitigating the onset of the corona. While increased aluminum content serves to reduce line losses and increase power flow, increased diameter also increases the conductor’s surface area. Bundling phase conductors can effectively do both with greater efficiency. Generally, bundled conductors are used at 200 kV or above and range from double bundled to six or even eight bundle designs. American Electric Power (AEP), one of the first utilities in the US to build 765 kV lines currently uses a six bundle conductor design, while China has built 1,000 kV lines with 8 bundle conductors. Bundled ACCC (Aluminium Conductor Composite Core) conductors have been utilized on UHV transmission lines due to their high strength and improved conductivity. In addition to reducing corona, audible and radio noise (and associated electrical losses), bundled conductors also increase the amount of current that can be carried compared to a single conductor of equal aluminum content due to the skin effect (for AC lines). Bundled conductors also lower reactance and reduce voltage gradients. As discussed, large conductors adopt lower percentage tension increases than smaller diameter conductors when coated with the same radial thickness of ice. As the number of sub-conductors increases (with comparable aluminum content to a single conductor), ice loads increase measurably. As the electrical attraction to a bundle with more sub-conductors increases, so increases the structural loads. If a small conductor has a greater difficulty supporting a large ice load than a large conductor, there is a sag cost associated with more sub-conductors as well. The cost-effectiveness of a bundle design and its component sub-conductors is a project-specific calculation. Up-wind sub-conductors can create oscillation on down-wind sub-conductors by casting a wind shadow that is understood to affect the leeward sub-conductors up to 20 diameters away. Aeolian vibration is generally less pronounced on bundled conductors due to the effect of spacers and/or spacer dampers installed at relatively close intervals along the line. Increased tension on bundled conductors appears to decrease their propensity for wake induced oscillation and galloping. During short circuit events, an electromagnetic attraction between sub-conductors causes them to slap together, exerting compressive forces on spacers and spacer dampers, which induces bending stresses on the conductor at the interface of the spacers. Conductor tension can also increase measurably (for a few milliseconds) on shorter spans. Spacers and their attachment methods must, therefore, consider these forces and be designed in such a way as to not damage the conductors or spacers. 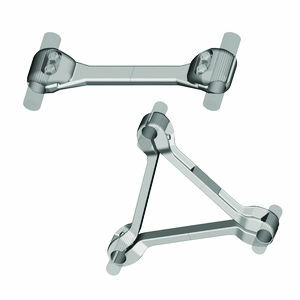 It is recommended that elastomeric-lined clamps on all spacers and spacer dampers be used. Armor rods can also provide additional protection. At the exact location of a short circuit, a conductor’s aluminum strand temperature can jump substantially and nearly instantaneously. 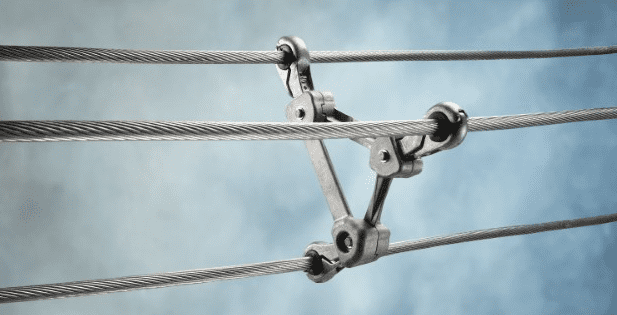 While it generally takes time for a conductor’s core’s temperature to rise, the nearly instantaneous increase in strand temperature can cause localized bird caging in the aluminum strands of any conductor type. While the ACCC Conductor’s core is much less thermally conductive than aluminum or steel, as with any conductor, in extreme cases a repair sleeve may be required to repair damaged strands. However, in most cases, any bird caging in the soft (previously annealed) aluminum strands will dissipate over a short period of time during thermal cycling. While the aluminum strands may loosen slightly for some period of time due to such an event, unlike non-annealed conductors, no loss of overall conductor strength or loss of core integrity will occur. This is a nice article. I didn’t get this much information about bundled conductors nowhere. Hi Charlie. Thankyou for the nice words.